Winter is on our door steps. Eventhough winter reminds me of all things ‘Christmasy’, it also comes with skin issues like dry flaky skin. Especially for people like me with a combination skin type, choosing the right product is of utmost importance. With oily t-zone and dryness in hands and legs, an overall lifestyle change is also required to address these climate related issues. The key is to use products that nourishes the skin well without stripping the skin of its moisture and natural oils. Cleansing is of utmost importance and this is the major factor that determines the longevity of a healthy and youthful skin. Use mild cleansers that are soap free to clean your face so that it doesn’t strip your skin of all moisture. I use body oil from Gia, as a first cleansing step to remove the dirt, sebum and pollutants accumulated over the day (read review here ). After this I gently massage my skin with Khadi cucumber and aloe cleansing milk. This cleanser is soap, sulphate and paraben free. This white thick cleanser is like a puree of aloe and cucumber and has the goodness of shea butter for that extra kick of moisture. It is very mild and gentle and will suit all skin types. It refreshes the skin well and makes it soft. At just 100Rs for 210ml, this is quite inexpensive. Cons: Doesn’t remove makeup or grime. Other suggestions: Oats based cleansers from Gia here , Silksplash from justherbs here , mix of chickpea flour(besan) and honey. 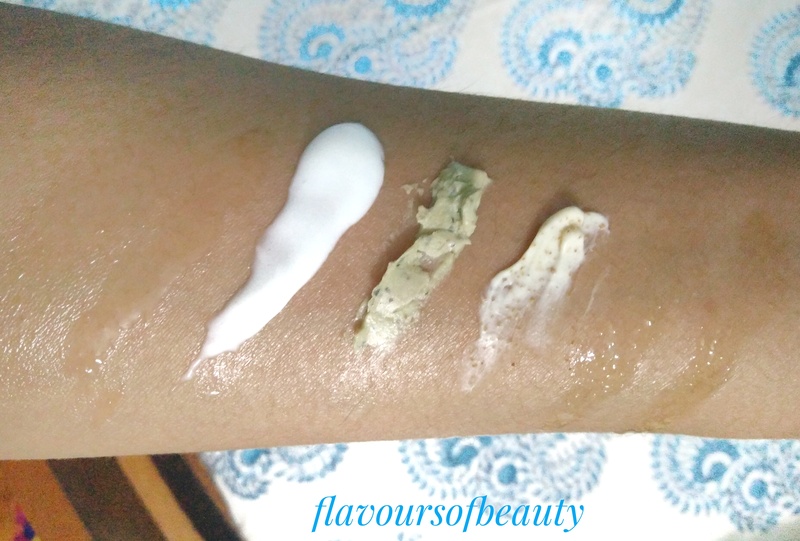 Kama Aurveda Kumkumadi brightening scrub and Greentea face and body scrub by Fuschia are my favourites this winter. Both are soap free and creamy. The Kama one has more gritty particles than fuschia one. Leave the scrub for a couple of minutes before washing it off, so that the awesome ingredients gets enough time to work on the skin. If your skin gets dry, stretchy or flaky, with white patches especially on your knees and elbows, using just a body butter or lotion will not help in the long run. It would just keep the area moisturized for few hours. If you want soft and supple skin for winter, oil massage is a must. 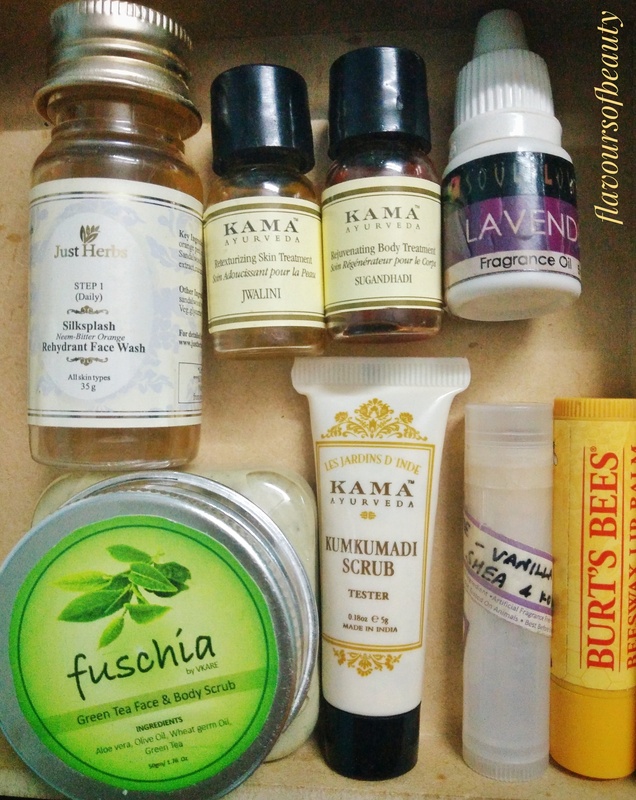 I have been using the oils Sugandhadi (Buy here) and Jwalini (Buy here) from Kama ayurveda as massage oils, and let me tell you, I just love them. These have the goodness of sesame oil,coconut oil, ashwagandha, cardamom etc and have very calming and relaxing ayurvedic fragrance. I sometimes feel that it has a hint of warm peppery smell. These are not viscous or very oily and gets easily absorbed by skin. Priced at just Rs 350 for 100ml, these are affordable as well. Wash it off with ubtans or green gram powder for best results. You can also use warm coconut or sesame oil instead. This process of ‘Abhyanga’ ensures that the skin is taken cared of during winters, relaxes the muscles and even gives a good sleep at night. I also add a few drops of Lavender essential oil from Soulflower, to the bath water and the fragrance is so relaxing. 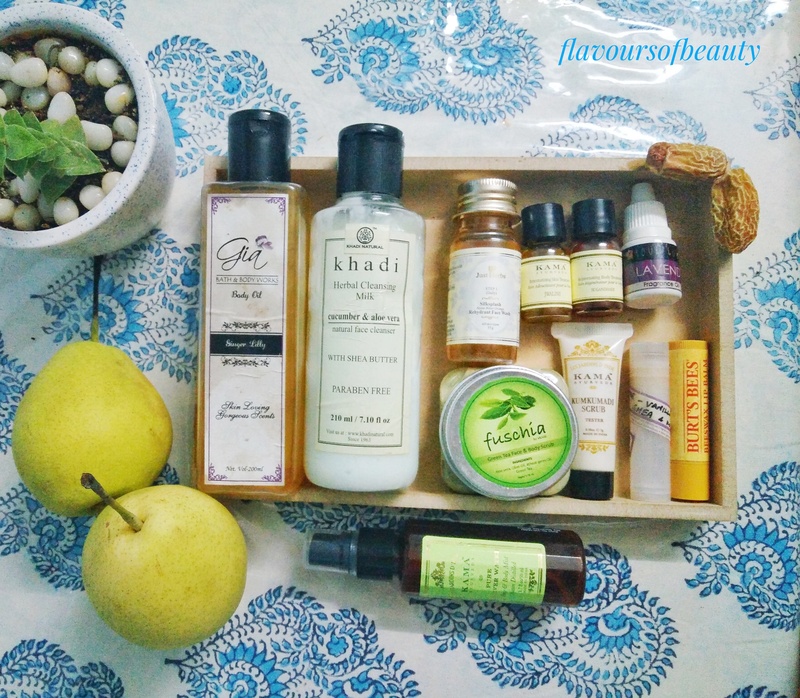 For face I use Kama Eladi Hydrating Ayurvedic Face cream (Read review here). This nourishes my combination skin, without making it oily. Take extra care of your lips, as they tend to chap easily during winters. My favourite lip balms are The Burt’s bees peppermint lipbalm (reviewed here ) and the Aroma Essential’s Orange vanilla lip balm (reviewed here). In addition to using suitable skin care products make sure you keep yourself hydrated throughout the day and keep away from beverages like coffee and tea if possible.